As Halloween is now just two days away and all of the churches “Trunk-or Treats” are in full swing, it makes you think why people like this “holiday” so much. What about this is so appealing? While the mound of candy you get is delicious, the most exciting part of Halloween is picking which costume to wear. 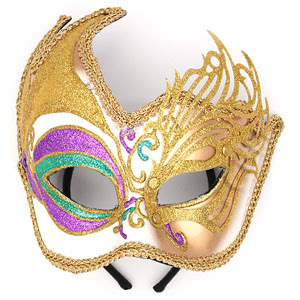 You get to be someone different for one night of the year; in other words, you get to wear a mask. Sometimes wearing a mask can be a one out of 365 days event; but we often find that some people wear masks 365 days a year. By wearing a mask, they are telling you what they want you to see rather than what is really true about them. Let’s face it- being honest about who you really are can be a scary thing. It includes being vulnerable, being open to criticism, and letting people see your weaknesses. This is no different when it comes to the homeless or the drug addicts or alcoholics. While their faults and mistakes may be more obvious, they are still prone to wear a different mask so that you might see and respect them a little bit more. Our biggest challenge on a daily basis is getting people to feel comfortable enough with us that they may take off their masks that they’re wearing and allow us to see the real them. No matter the problems, addictions, past troubles, or current failures, we just ask for honesty and openness. This is a big request. Thankfully, Jesus is continuing to transform our hearts to look more like his, so we are able to share with people our weaknesses, our failures, and our defeats. This is only because Jesus took all of our struggles and nailed them to the cross. Because of the cross we are able to take off our masks and show others the real thing: the good, the bad and the ugly. The past couple of months have been a whirlwind of many new opportunities for Urban Purpose. One of the biggest and most exciting changes was the move to our new office space! We are thrilled to finally be able to introduce you to our new home, which includes a rent reduction of 40%, and being connected to a snazzy coffee shop. Our new place is called “The Hub” and is located on Oxmoor Road, directly connected to Seeds Coffee Shop. While cheaper rent is always a plus, this location came with a great deal of other benefits that fit perfectly into our ministry: a conference room for meetings, commons area for waiting or engaging with others, and a community of like-minded and like-hearted people that are on a mission to serve God and Birmingham. The people that brought us into The Hub are a community of micro-churches called The Common Thread Community. Their desire is to see people laboring together to further the gospel. Check out the video below and let Taylor McCall tell you a little more about who they are and what they are striving to achieve! We would love to have you stop by and visit The Hub for a cup of coffee or just to check out our new space. As always, thank you for your continued support. We look forward to seeing how being a part of this community will help us meet and develop relationships with people all across Birmingham! At times it can be easy to overlook how God is working all around us. He gives us the heavens and the earth, the flowers and tress, the oceans and the mountains that all shout his praise yet we can still be blind to the ways He intervenes in our every day lives. Thankfully, God knows that we’re human and is gracious to remove our blinders with an obvious move on his part from time to time. From working in the ministry on a day-to-day basis, we see God move in many different ways and he reminds us that yes, He can still move mountains. At times like this we can be quick to chalk this up to coincidence or “good timing”, but we know the truth is that God bends down and hears the prayers of his children. This is just one of the many ways that God works in this ministry on a daily basis. We are excited to share this story and many others with you so that together, we can praise our God as the all-knowing, all-powerful and all together majestic Father he is! Yesterday we got a special visit at our Sunday meal from a friend we have known for over four years now. This man was one of the roughest guys we had ever been around downtown and was at times intimidating to be around, but for some reason we were constantly drawn to him. Four years ago, his future did not look bright. After a failed attempt at a recovery program, it seemed that there was nowhere else to go but straight back to the streets. Thankfully, because of the relationship that was built between Urban Purpose and this man, he kept coming back. He saw the hope and love that these men had for him, and he WANTED that for himself! On November 26th of this year, he will have been clean for four years now. He has kept a good job, has his own apartment and a car. It can be easy for us to measure success in terms of immediate results. When things don’t go well, we can be quick to wonder if the investment was worth it. God graciously reminds us by his investment in us, that loving God’s people is always worth it. From time to time I sit down and write my boys. Below is what I wrote to them back in July of this year. Well, it’s been a different kind of week. I am in a place of plowing new ground. There have been a lot of changes in all our lives the last month. Know this -our God’s love, full of great mercy and grace, will never change for us. It is the only reliable and consistent love I have been able to receive that means anything in my 50 years of living in this world. Keep loving in all you do. Everything we do must have His love as the source (the reason) or what we do is worthless. That really means we have to walk, closely, in a right relationship with our God consistently. I know you both know all of this. Make sure you do these things and love big- bigger than you could ever imagine. As I thought about how I prompted the boys to love big, bigger than they could ever imagine, I began to think about the different facets of God’s love. I thought about how effortless HIS love is for me. How simply he’s able to offer me his love in order for me to receive it. But in contrast, I think about how much God loved me through sending his only son to die for my worthless soul. How hard that must have been to sacrifice his one and only son for me. A sinner. I can’t claim to think like God, but I can’t think that this was an easy choice. It’s a two-way street that is impossible for me to understand but is amazing to receive. Loving those that God has called us to love can be easy. At the same time it can also be very difficult. When people begin to make good decisions, find job opportunities and as their addictions fade they can be easy to love. Loving doesn’t take a great amount of effort under these circumstances. On the other hand, when bad decisions are followed by more bad decisions, things don’t make sense. When jobs are lost, things seem hopeless. When the battle of drug use continues, this is when it’s hard to love big. The only way we can love folks during these times is when we are in a right and consistent relationship with Christ. Loving folks has nothing to do with my ability to love. It is God’s love flowing through his children to reach a lost world. As we go on living our lives day after day, we quickly begin to take things for granted. These things could be as small as having a car for transportation, taking a shower every morning or putting on a pair of shoes as we start our day. This past weekend we were able to fulfill someone’s wish of retrieving his birth certificate from the state he was born in. Not only will this be beneficial for this man when it comes to job searching and finding an apartment, but now he KNOWS that we care for, love and are here for him. We have been telling him this for years and he has been very slow to believing this. It’s always beautiful to witness people begin to learn what it means to trust again when God helps us follow through on such small requests. Jesus can change someone’s heart by something as small as getting a person their birth certificate. Many of the men and women we work with forget what it feels like to be loved by someone and this makes trusting others a difficult task. We are eternally grateful that Jesus loved us enough that we can trust Him with our lives! Yesterday was a day full of ups and downs for Urban Purpose. The day started with a phone call from a man whose life, as he described it, was crumbling right before his eyes. He lost his home, his belongings, and all stability that he’s had for the past year. Downtown that afternoon we had a great group of volunteers of all different ages. A group of high school girls and their leaders went from person to person asking how they can pray for them, and many people were appreciative. One man in particular was so touched by their prayers that he broke down in tears and let out what he was struggling with. The group of girls led him over to Jim and Mark, who then gave him a card in hopes that he would follow through and want to get together this week. Thankfully, we received a phone call this morning. To finish off the night, we were able to celebrate one of our guys 24th birthday. The dinner table that night was full of people that love him: his parents and little brother, his grandparents, all of us from Urban Purpose, and a group of guys that have been hanging out with and pouring into him. Wow! It’s not very often that someone recovering from a drug addiction feels this kind of love and support- something as small as a birthday dinner can have an incredible impact. Days like yesterday are great reminders that when walking with people through life you are never guaranteed anything. Some days things look really bad and people want to give up on life, and other days people are given reasons to celebrate the life they are now living. Only one thing is for sure, that the most important part of what we do is making sure these people are never alone as they walk through these trying stages of life. Not only do we walk with them, but we have a Father who will never leave or forsake them!